[T]here’s one Virgilian journey that has indeed been a constant presence, and that is Aeneas’s venture into the underworld. The motifs in Book VI have been in my head for years—the golden bough, Charon’s barge, the quest to meet the shade of the father. Virgil (70-19 b.c.e.) sits between Clio, the Muse of history, and Melpomene, the Muse of tragedy, in this third-century mosaic from a site at Sousse, Tunisia. Aeneid VI starts with the hero’s making landfall at Cumae, the northern point of the Bay of Naples. There the Trojan exile meets the Sibyl, prophetess of Apollo, who guides him down into the Underworld, directs him to the golden bough that will give him access, and joins him on his ghostly journey: encounters with Charon’s ferry of the dead, the hellhound Cerberus, Trojan comrades and Greek foes fallen in the war at Troy, the shade of Dido who died for love of him, and finally to the desired meeting with his father, Anchises (replacing the mother visited by Homer’s Odysseus). rhythm and metre and lineation, the voice and its pacing, the need for a diction decorous enough for Virgil but not so antique as to sound out of tune with a more contemporary idiom—all the fleeting, fitful anxieties that afflict the literary translator. Virgil’s language is not ornate: “neither overblown nor understated,” as a Roman contemporary put it. All great poetry is modern, that is, readable in the modernity of its idiom—whatever the occasional recourse to high style, to archaism, to technical language, to neologism. The job of the translator is to create poetry out of poetry, idiom out of idiom, and Heaney has done that job superbly, capturing the energy of the original, emptying the word-hoard with narrative, description, and character speech brilliantly represented and renewed, always in tune with the varying emotional registers of this, the most pathetic of the Aeneid’s books. Rare is the translation that brings over into true poetry, as this one does, the words, the tone, the music of the original. Heaney’s 1,222 lines convey the entirety of Virgil’s 908, printed on facing pages—clearly important for Heaney. The morphological and syntactical compression of Latin, relative to English, make this just about right (Dryden needed 1247 lines, Mandelbaum, 1203). Heaney, like them unconstrained by the Latin line, can linger where lingering matters, as when Aeneas looks his last at the unresponsive shade of Dido, in a single, packed line of Latin that here becomes almost two: “gazes into the distance after her | Gazes through tears, and pities her as she goes.” The expansion by repetition draws attention as well to Virgil’s striking use of the verb prosequor, here used in Latin for the first time to mean “follow after with the eyes.” Elsewhere, memory of a son’s fall, through failure of a father’s art, leads to a second failure of art, and the falling of the artist’s hands: “Twice | Dedalus tried to model your fall in gold, twice | His hands, the hands of a father, failed him.” The consecutive lines of Virgil begin with bis (“twice”), a word effectively moved to line-end in the English. In the Latin, Virgil’s description ends mid-line, mirroring the unfinished artwork, but the translation needs two full English lines. Virgil in three words gets the horror of the father trying and failing to depict the death of the son: patriae cecidere manus. He does so by placing the adjective (“belonging to a father”), which in Latin can have the force of a noun, in the emphatic first position. Heaney gets the same effect in nine words, by doubling “hands” (manus), supplying the noun (“of a father”), with the indefinite article universalizing the catastrophe. “Fall” and “failed”—cognates in Latin as well (casu….cecidere)—get to the heart of the noun and verb. This sort of exercise could be repeated over and over again throughout the translation. Or just read it, and know you are close to the poet with whom Heaney was living these last years. English for the most part has lost touch with the metaphor in its (frequently Latin) etymology, but Heaney’s English nestles up to those origins, again keeping a version of the Latin in his words. He clearly cares about the language and about his representation of it. The body of a dead comrade “Lies emptied of life” (iacet exanimum, literally, “breath gone out of it”); the cave to the Underworld is “A deep rough-walled cleft, stone jaws agape” (hiatu, often with the meaning bodily gape, yawn). Down below we meet various personified evils, including “Death too, and sleep, | The brother of death,” as always eschewing the Latinate (consanguineus) with the Anglo-Saxon “brother” underscoring the metaphor. And where Heaney finds pure metaphor, he translates that, too, as in Virgil’s “rowing with wings” for Daedalus, or his “prows frill the beach” for the Trojan ships on the shore of Italy. Flaps out from a knot tied at the shoulder. Some critics, chiefly Anglo-Saxonists, found fault with the Hiberno-Englishisms of Heaney’s translation of Beowulf, as indicating inept appropriation. But others rightly saw it as an act of stealing in the best sense, transforming “the song of suffering that is Beowulf into a keen for his own people’s troubles,” (as Thomas McGuire wrote in New Hibernia Review). The much reduced use of such language in Aeneid Book VI confirms this more creative view of the matter. Not that Virgil cannot be treated that way at times, as with “scringe” (“scratching sound”) above. In fact the practice of domesticating into Hibernian—never intrusive, but unmistakable—continues that found in Heaney’s translation and adaptation of Virgil’s pastoral eclogues in Electric Light, from 2001: “Bann Valley Eclogue,” where the Virgilian golden age is thoroughly Irish: “Cows are let out. They’re sluicing the milk-house floor”; or the translation, “Virgil: Eclogue IX,” where a bull is “The boyo with the horns,” while the older shepherd says, “That’s enough of that, my boy. We’ve a job to do.” Virgilian pastoral and Irish poetry are akin, both close to the soil, in Heaney as in Patrick Kavanaugh and John Montague. 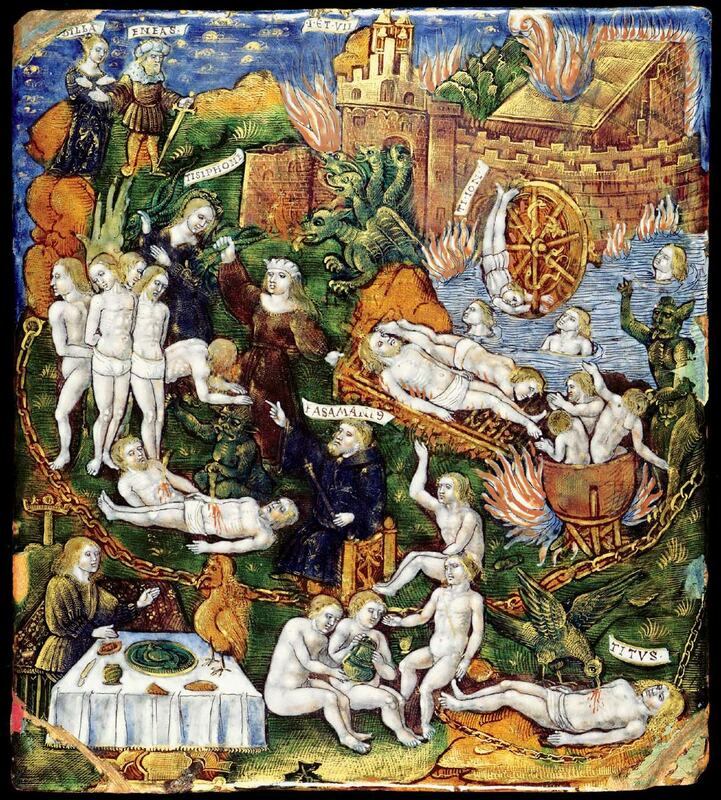 So it is that this Aeneid can feel at home in Ireland: “fell like a dead man | On a heap of their slobbered corpses” for confusae (“jumbled”)—perhaps recalling the “warm thick slobber | of frogspawn” from “Death of a Naturalist”; “nor bury in home ground”; “in the very lowest sump”; of Silvius, “the lad you see there.” Heaney’s Aeneas, at the funeral of his captain Misenus, even takes on the look of Father McGlinchey, “asperging men lightly | From an olive branch.” This all works because we want to hear Heaney along with Virgil. Does he go too far when the Sibyl, to subdue Cerberus, “flings him a dumpling of soporific honey | And heavily drugged grain”? I think not. It is worth it to think of our poet smiling at that line, even in the Underworld. None of us has one definite home place. On meadowland in earshot of running streams. It is not hard to imagine Seamus Heaney, who spent so much time with Virgil in this world, now reunited in the next, haunting such woods with the Roman poet, as they do in this breathtaking new translation. Richard F. Thomas, Lane professor of the classics, is the author of several works and commentaries on Virgil, and co-editor, with Porter professor of Medieval Latin Jan M. Ziolkowski, of the three-volume The Virgil Encyclopedia (2014). For more on the Encyclopedia, see “A Poet’s March of Ages” (January-February 2014, page 11). For more about the poet, read “Seamus Heaney, Digging with the Pen,” by Adam Kirsch (November-December 2006, page 52).